Eucerin has to be one of those skincare brands that I don't think is mentioned enough in the blogging community. I admit I haven't used many of their products before but I always turned to Eucerin Dry Skin Relief Cream when suffering from the occasional dry skin days back then when I was a teenager. It was a complete skin saviour back in the day. When Escentual gave me an opportunity to try out the Eucerin Dermo PURIFYER Cleanser I jumped at the chance. As someone that suffers from oily skin and acne breakouts I wanted to see if this would make a difference to my skin as it's suitable for those with oily and blemish prone skin. Eucerin Dermo PURIFYER Cleanser is completely soap and fragrance free with 6% Ampho-Tenside and it's also supposedly non-comedogenic too. This is good news for those that suffer from frequent breakouts like myself, there's nothing worse than a cleanser that blocks the pores causing even more breakouts than before. I have also noticed that it has only at least 8 ingredients mentioned on the back of the packaging. This is different compared to many cleansers I have used in the past that are normally full to the brim with at least 10+ ingredients. Isn't this a good sign? I have used it for 4 weeks now, both morning and night without fail after my first cleanse. I always like to remove my makeup first with my Garnier Micellar Water and use a second cleanser to make sure every trace of dirt and makeup is removed. I always wet my face first as instructed and squeeze a small amount of the gel cleanser onto my hand and work it into a lather before applying to the face, avoiding the eye area. I then rinse with warm water and gently dry my face with a towel. It was incredibly gentle on the skin, no sign of any irritation and I was left with great, thoroughly cleansed facial skin. The Eucerin Dermo PURIFYER Cleanser didn't make my face dry out at all and it didn't tighten up my skin but it didn't feel overly oily either. My face felt fresh, clean and balanced out with a much more even and soft complexion. I can't say whether or not it has helped to reduce my spots but it's certainly changed how often my breakouts appear on my skin(which was very often). If you have oily and blemish prone skin then I definitely recommend you try out the Eucerin Dermo PURIFYER Cleanser. You can purchase the Eucerin Dermopurifyer Cleanser from Escentual for just £9. 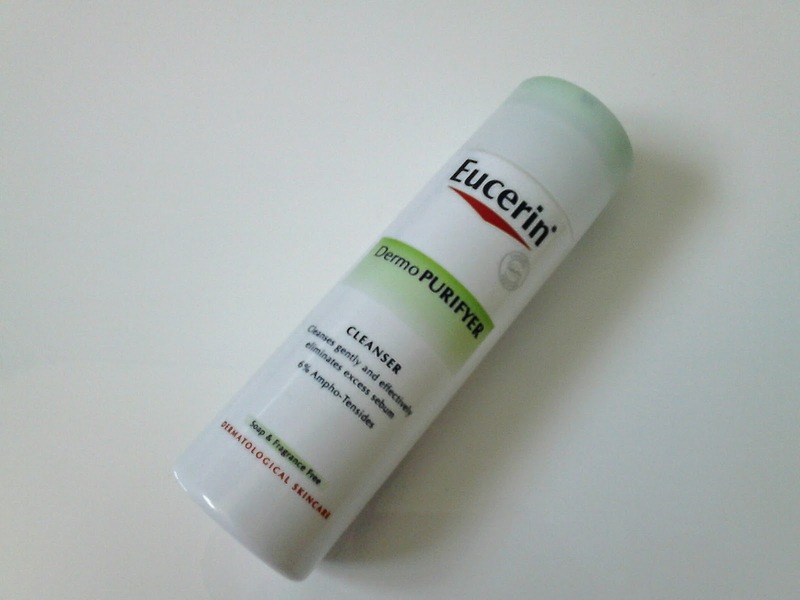 Have you tried the Eucerin Dermo PURIFYER Cleanser?